Relacore Reviews (UPDATED 2019): Is It Safe? Relacore Reviews: Is It Safe? Relacore claims to be the #1 selling pill to reduce body fat and a natural method with which to fight aging that is related to stress. The product’s official website lists several benefits of the product, including its abilities to assist in improving your mood, reducing your stress levels and increasing your energy to fight fatigue. Relacore’s formula is accelerated to burn fat and supposedly helps its users lose body fat while providing you with more energy so that you see results fast. Relacore claims to address the connection between stress, tension and excess belly fat, but it doesn’t actually contain any ingredients that have anything to do with fat loss. In fact, many of Relacore’s ingredients are mainly used in products designed to treat fatigue and anxiety, which means Relacore may not be the effective weight loss tool that it claims to be. Let’s take a look at the product and determine exactly what Relacore is, and what it is not. Relacore is manufactured by Carter-Reed, a Utah-based company with a history of facing several class action lawsuits, many of which have been filed in response to the company’s alleged false advertising of their products, including Relacore itself. 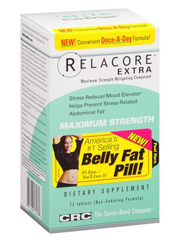 Relacore’s claim is that it helps to reduce stress-related fat from accumulating in your belly. When you’re stressed, the rate at which your body stores calories from food accelerates due to the increased levels of a stress hormone known as cortisol. This leads to gradual weight gain, with a particular focus of accumulation in your belly and abdominal area. Relacore’s manufacturers claim that their diet pill will help users reduce their stress levels to trim body fat and even look younger. 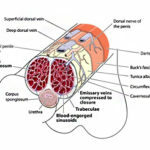 However, the amount of available information regarding how Relacore actually works in your body to accomplish everything it claims to do is virtually non-existent. What’s Inside of It? What Are the Side Effects? Unfortunately, the ingredients that make up Relacore’s formula are not disclosed. The product’s label lists the only ingredients as being magnesium, biotin, zinc, niacin, thiamin, iron, folic acid, vitamin C and vitamin B. All of these are vitamins and minerals that do not have anything to do with the weight loss process. In addition to these vitamins and minerals, Relacore’s manufacturers claim that their formula consists of a blend of natural ingredients. While the dosages remain undisclosed, Relacore’s propriety formula apparently consists of phosphatidylserine, jujube, passionflower powder, perilla extract, magnolia, and perhaps most controversially, Asian ginseng extract and Chinese skullcap, both of which have previously been linked to dangerous side effects such as chemical liver damage and unpredictable moodswings, respectively. In addition to these proven dangerous side effects, Relacore remains untested, so various other side effects may result from the use of this product. But the presence of liver-damaging and mood-altering ingredients is contradictory enough to the claims that Relacore is a safe product to help reduce stress and aid in weight loss. Relatively inexpensive, you can get a bottle of 72 Relacore capsules for just $30. Your purchase also comes with a money-back guarantee within 90 days. Relacore is not really a true diet pill; the pill’s official website even admits to this, referring to the product as more of a “weight loss adjunct”. Considering Relacore’s lack of ingredients that have anything to do with actively promoting weight loss, Relacore may be ineffective if not paired with a healthy lifestyle of diet and exercise. Health experts have not tested Relacore, so potentially uncomfortable or dangerous side effects may remain unknown. The lack of available information concerning the product’s active ingredients also cast doubt on the effectiveness of Relacore, and the growing number of lawsuits that Carter-Reed company is facing in response to its misleading statements concerning the drug definitely calls into question the credibility of Relacore. While many components of Relacore remain untested, ingredients like Chinese skullcap and Asien ginseng have actually been scientifically proven to be linked to such dangerous side effects as liver damage and unpredictable mood swings. Relacore claims to address the connection between hormonal stress and your body’s storage of excess fat; unfortunately, there is a serious lack of available information regarding how Relacore actually works in your body to resolve this issue. As opposed to an actual diet pill, the goal of Relacore seems to be more focused on relieving the stress in your body, allowing you to focus on sticking to a healthy diet and routinely exercising without any anxiety concerning your ability to stick to a newer, healthier lifestyle. As it is untested, Relacore may contain unknown side effects. However, it can be assumed that Relacore is generally unsafe due to the presence of Chinese skullcap and Asian ginseng, both of which can result in dangerous side effects. Judging from the information available about Relacore, the drug seems to be more of a stress reducer and less of an effective diet pill. Unfortunately, due to a lack of available information about Relacore, its methods of addressing the relationship between stress and your body’s storage of fat remains unexplained and unknown. Relacore is also ineffective as a stand-alone diet method, so users should be prepared to adopt a healthier lifestyle of diet and exercise. 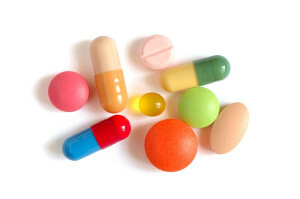 Considering the fact that this pill’s active ingredients contain components that are clinically proven to run the risk of dangerous side effects, the amount of lawsuits that Relacore’s parent company is facing due to their false advertisement of this product should be more than enough to keep you away from Relacore.